Well guys, what do you think ? Does it look like a FLOWER to you ??? This has been in my list to do since 2 years ago.... still.... I was like GO or NOT TO GO playing in my mind. ! 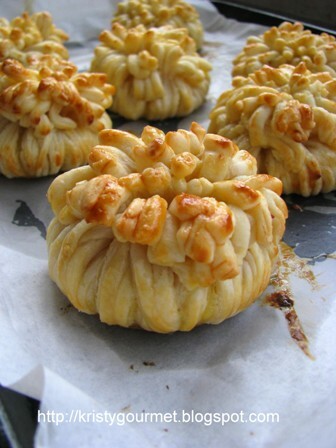 And then I was inspired by Sonia when she post up the Hydrangea pastry the other day. Oh well, since I have started all kind of pastry making for the past couple of weeks, I think it shouldn't be any problem. So, I just go ahead. 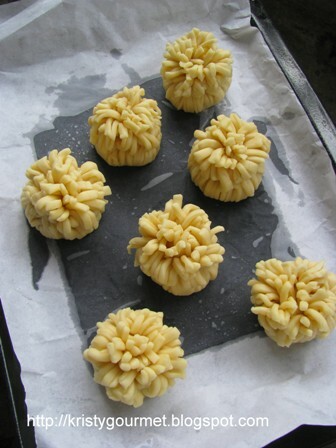 Actually, I've been asked if I can finished up the mooncakes that I've been making for the past couple of weeks. No problem ! I have all the mooncakes served to friends during the meet up every night at my place. There will be more coming after this. So, stay tune ! I'm using the salted egg custard for the filling. The colour is fantastic. And here's the recipe as follow. 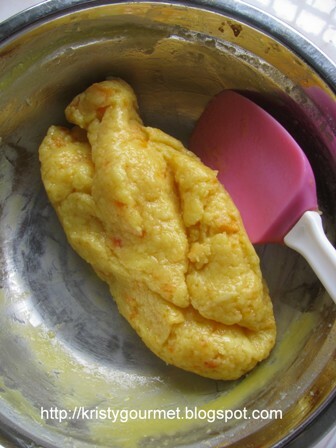 (1) rinse salted egg yolk with some vinegar then steam the yolk for 10 minutes or till cooked. Break salted eggs into crumble & set aside. (2) beat together egg yolk, sugar, milk, flour & vanilla essence into a big stainless steel bowl till everything is well cooperated. Add in the cold butter and do not beat. (3) fill a small sauce pot with water and then bring it to boil, reduce the heat to medium then place the mixture bowl onto the pot and let it steam cook the mixture became thick paste. Remember to stir the mixture gradually. (4) once its done, off the heat and stir in salted eggs crumble. Set aside to cool. (1) in one bowl, combine ingredients (A) except water, rub butter & the dry ingredients till well cooperated. Then add in water to form a non-stick soft.dough. Knead to smooth then set aside. (2) in another bowl, combine ingredients (B) till everything well cooperated then divide into 10 portions. 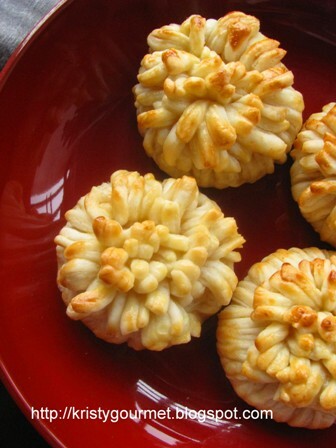 (4) for further rolling method, please refer here, Chinese Pastry, or here. 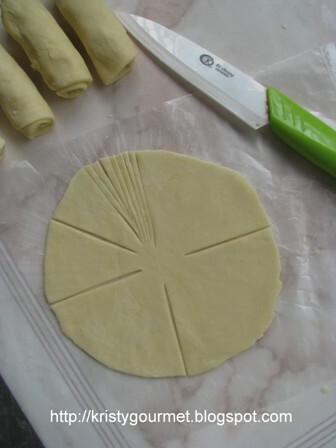 (5) now, press both end of the pastry dough into center then flatten it by rolling it into round shape on a plastic sheet. (6) make the cut as shown on 1st picture on the left, the shreds shouldn't be too thick. (7) place in the custard fillings, cover the other side with another piece of plastic sheet then turn it around. Slowly flip the dough away from the 1st plastic sheet, as shown on 2nd picture on the left. 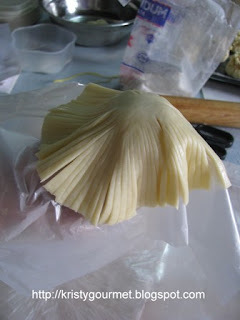 (8) then pull the center up by holding the filling with the shreds facing down, slowly release the other plastic sheet as well. Finally, lock to seal the shreds by pressing them all together with your hand. (9) now, turn the dough around with the loose shreds facing up as shown on the above picture. Simply spread them loosely and then brush on egg glazing. (10) next, bake at preheated oven 190-195'C for about 20 minutes or till brown. So, here's what I got ! What a happy ending. Absolutely adore how it turns out. Simple & beautiful. Don't you love them too ? 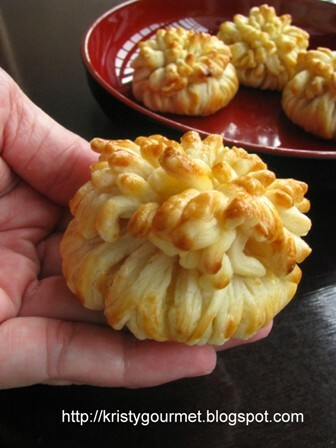 Another awesome mooncake from your kitchen, you are great! Nice to meet you Kristy^^your blog is fantastic! !